The National Theatre’s acclaimed production War Horse, which has just finished a three-week run at The Regent Theatre, has been announced as the theatre’s most successful show ever. Demand for tickets for War Horse was phenomenal, with almost 30,000 people visiting the theatre to catch the world renowned show performing at The Regent after it opened to delighted audiences on Wednesday 24 September. The show has also broken all box office records – taking just over £1 million gross in total. The star of the show, Joey, has been a prominent figure in Stoke-on-Trent since the show was announced last year. Earlier in 2014, he visited the stunning Gladstone Pottery Museum to help officially launch the show in Stoke-on-Trent, while he has also appeared at the front of the theatre to greet local press, and two-weeks ago visited Endon Riding School to meet his namesake, Joey George. 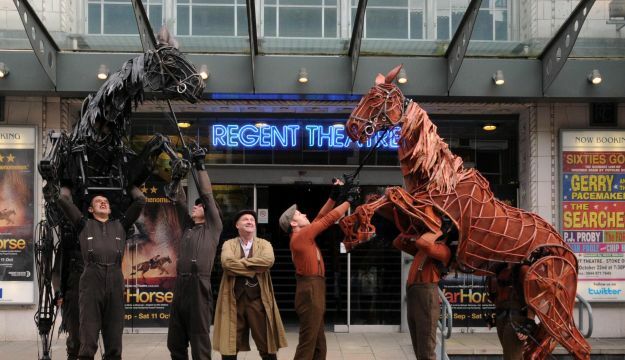 General Manager of The Regent Theatre, Andrew Nicklin, said: “War Horse has captured the hearts and the imaginations of people across Stoke-on-Trent and Staffordshire and the show has had a huge impact on audiences. It is that type of show, life-affirming theatre. Chris Harper, the producer of War Horseand Managing Director of National Theatre Productions said: “We are absolutely thrilled by the phenomenal reception that War Horse has had from audiences in Stoke-on-Trent. “As the War Horse company heads off for its next stop in Johannesburg, they take with them happy memories of their stay in Stoke-on-Trent. The National Theatre’s production of War Horse,adapted from Michael Morpurgo’s novel, is the powerful story of a young boy called Albert and his beloved horse, Joey, who has been requisitioned to fight for the British in World War I. Caught in enemy crossfire, Joey ends up serving on both sides during the war before landing in No Man’s Land, while Albert, not old enough to enlist, embarks on a treacherous mission to find his horse and bring him home. A remarkable tale of courage, loyalty and friendship, War Horsefeatures ground-breaking puppetry work by South Africa’s Handspring Puppet Company, which brings breathing and galloping horses to life on stage. The National Theatre will be back at The Regent Theatre next year when their critically-acclaimed production of The Curious Incident of the Dog in the Night-Time visits the theatre in February 2015.